Google page 1 ranking is guaranteed for all properties listed on BestHomesBC.com with a direct link to Realtors' and Developers' contact details. Nicola Way - founder of BestHomesBC.com - writes a weekly real estate column in the Vancouver Sun and the National Post, and in the past has written for a number of other real estate publications including Sing Tao Daily, the WestEnder, the UK's 'Canada' magazine, OPP China, A Place in the Sun, Homes Overseas, and WestCoast Homes & Design. Please click here to add a property or development to the site. Read our weekly real estate column, 'Sold (Bought)', in the Vancouver Sun that reaches 481,100 readers. Read our WestEnder real estate focus that features recent downtown Vancouver sales. 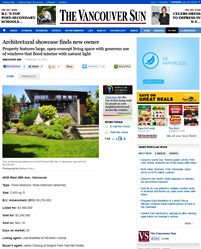 See our twice-monthly real estate feature in the National Post. Estimated readership 1.5 million.